In April 2010, the UK Government launched its Feed-in Tariff (FiTs) scheme. Also known as the Clean Energy Cash Back scheme, the policy means you will be paid by your energy supplier for all the renewable energy you produce. With a PV Energy solar system you could generate over half of your electrical energy needs. Our qualified advisors will give you accurate data for your property and advise which of our systems will provide maximum power for you and the very best return on your investment. At a generous 4.39 pence per kWh paid for all electricity you generate you can expect to receive payments of up to £167* per year, depending on the size of system installed. Furthermore, a significant proportion of the electricity you currently consume and pay for will now be self generated by your PV Energy solar system, whilst any electricity generated but not used will be exported back to the grid for a guaranteed payment of 4.85 pence per kWh on 50% total generated solar electricity. Taking into account what is paid to you and saved by you, you can expect to reduce your spending on electricity from 30% to 70% per year. In order to incentivise people to adopt renewable energy, the current Feed in Tariff will be paid for 20 years, TAX FREE and INDEX LINKED... that equates to a minimum return on investment of around 10%. For full details of the return of investment figures please call 01684 774006 and we will be happy to advise you. How much power will PV deliver? The performance of a PV (solar) panel is measured in watts peak (Wp), which refers to the amount of energy the panel generates in full sunshine. It is widely accepted in the UK that a solar panel system comprising of 1000Wp (or 1kW) will produce upto 971kW per annum*. OFGEM estimate that the average UK household consumes 3300kW per year so the green electricity generated by your PV Energy solar system will go a huge way to providing you with energy self-sufficiency by providing over half your energy needs. The facts and figures speak for themselves but every home is different, which is why it is vital that you have a 'no obligation' consultation with one of our advisors before committing to any PV (solar) panel system. 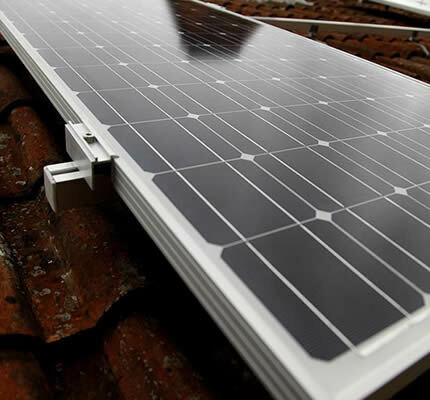 Solar Technology PV Energy Ltd designs a complete range of advanced solar systems which are perfect for smaller dwellings such as apartments right through to large family homes. We provide all services including initial evaluation, system design and specification right through to installation, commissioning, servicing and after sales support. The Government's Feed-in Tariff scheme has been created to encourage early take up of PV solar technology. Based on a similar, highly successful scheme in Europe, the current scheme is only open to new entrants at the current 4.39p for a limited period. It is therefore advisable to invest in your Solar Technology PV Energy system as quickly as possible, especially as demand is set to soar as we approach the next Feed in Tariff reduction deadline. * ROI based on a PV Energy 4kW PVE system. ** Data courtesy of the Energy Savings Trust - assumes a south facing aspect and a roof angle of 35 degrees.